Direct Salon Supplies Universal Styling Link Unit in dark wood or black finish (Please use the drop down box to choose your colour). 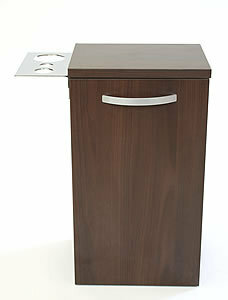 Comes with chrome dryer and tong holder which can be fitted to either side of link unit or on the wall. Sizes: Height 50cm, Depth 22cm, Width 28cm without dryer tong holder, Width 39cm Width with dryer tong holder, storage cupboard size Height 46.5cm.